Wouldn’t you like to be one of ten Florida families who will win two free years of college from the Florida Prepaid College Foundation for their child or grandchild? I know we would love winning this opportunity for our son. The annual Florida Prepaid scholarship giveaway runs between September 19, 2016 and October 23, 2016 – coinciding with National College Savings Month and launch of Open Enrollment for purchasing a new Florida Prepaid Plan. It’s simple to register to win at floridaprepaidscholarshipprogram.com. You will have chances to earn extra entries by answering questions, learning more about saving for college and sharing on social media. There will also be chances to win a total of 50 weekly prizes. The 2-Year Florida College Plan is one of five available Florida Prepaid Plans, which all include tuition and other specified fees. A family can purchase Plans all at once, over five years or in monthly installments. Learn more at http://www.myfloridaprepaid.com/. Florida Prepaid’s 2-Year Florida College Plan covers tuition and other specified fees for 60 lower division credit hours at a Florida College. This plan offers a child the opportunity to earn an associate’s degree or certification in any number of fields, and is an excellent springboard to a fulfilling career or further education. A student earning an associate’s degree from a Florida College is guaranteed admission to a State University in Florida. Many students are going in debt across the country trying to obtain the necessary postsecondary degree needed for career success. Last March, the Federal Reserve reported student debt across the U.S. at about $1.2 trillion. Meanwhile, more than two-thirds of new alumni have debt, at an average of $35,000 per graduate. In Florida, the average debt load for those with college loans is $24,017. 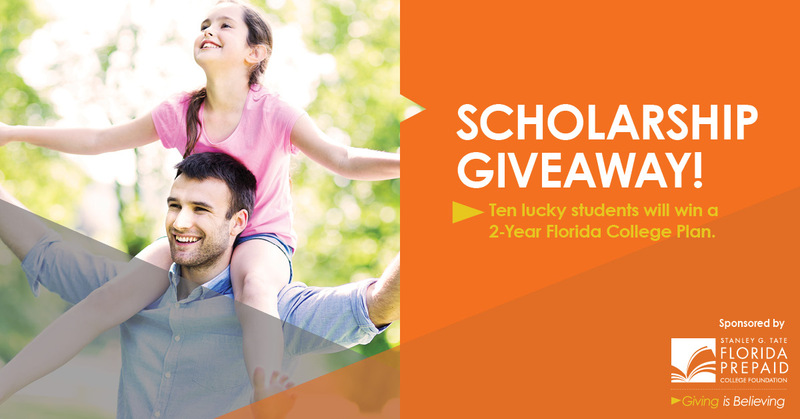 Now it’s time to be one of the lucky Florida families to win one of ten 2-Year Florida College Plans by visit www.floridaprepaidscholarshipprogram.com between September 19, 2016 and October 23, 2016.